As far as funky named slots go, this release from online slot developer NextGen Gaming is not far from being one of the best we’ve seen. Potion Commotion, the name says it all and you don’t even have to know what this slot is about to get excited about playing it. 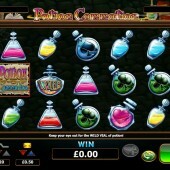 Potion Commotion is a 5 reel, 20 pay-line slot and, you guessed it, there is a theme revolving around science and potions. If you enjoyed playing other potion-type slots such as the colorful Potion Factory from Leander Games or the love-themed Love Potion from Microgaming then you will certainly want to get your hands on this slot sooner rather than later. Eureka! It's Just Like a Science Lab! The reels are laid out in a great way that makes you feel like you’re in an eccentric scientist’s laboratory. The reels are set inside a potion stand with the different potions acting as the symbols. There is a Wild potion that substitutes for all other symbols except for the Scatters to complete winning combinations. 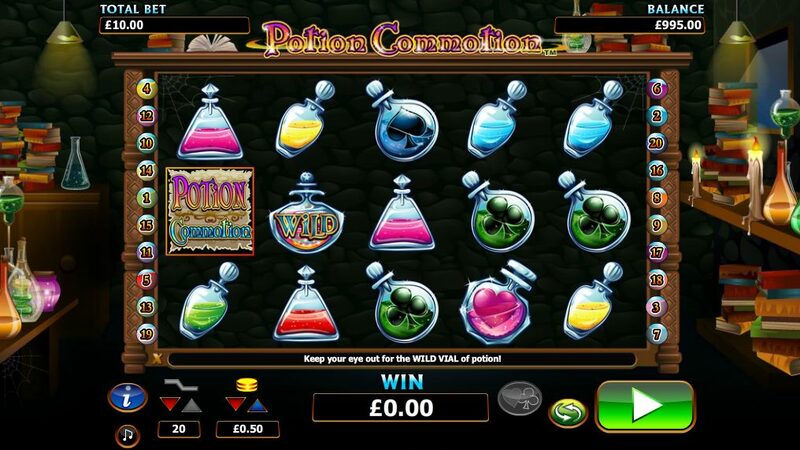 The Scatters are represented by the Potion Commotion symbol and if you hit three or more of these across the reels then you will trigger the free spins bonus round. If you hit three Scatters to trigger the bonus you will win 10 free spins. If you trigger the bonus by hitting four Scatters you will be awarded with 15 free spins. If you are lucky enough to hit five Scatters across the reels to trigger the bonus then you will win 20 free spins. To add to the free spins chaos, a 3x multiplier is added to all wins achieved during the free spins and you can re-trigger the bonus during the free spins. The free spins bonus round is fun and there are some big wins that can occur but this is a very standard slot by NextGen Gaming. If you enjoyed other top NextGen Gaming titles such as the oriental-themed Emperor’s Garden and the high octane Evel Knievel then you will get your kicks from playing this. If you aren’t the biggest fan of NextGen Gaming slots then I’m afraid it’s pretty much more of the same.